View More In Panniers & Rack Trunks. This lightweight bag comes with 3 Velcro straps for easily and securely mounting onto a rack so you don't need to worry about the bag moving around on the rack. With a small bottle pocket, you can put your drink and other items separately. BV Bike Commuter Carrier Trunk Bag is your perfect company on the way to gym, school and work! 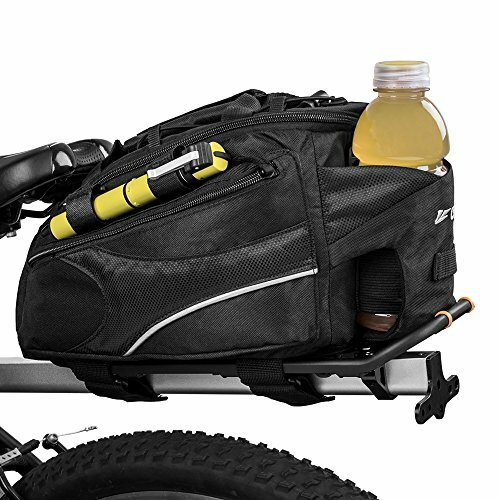 The bag comes with 1 carrier handle and 1 shoulder strap so it's really convenient for you to carry when you are not cycling. Bag is lined with reflective trim on the pockets for nighttime safety. With 3M Scotchlite reflective trim on pockets that ensure the night time visibility, cyclists can have safe riding experiences at night! One can simply attach the bag onto the rack by 3 Velcro Straps. Simple and Easy! This bag also comes with another Velcro straps on the side to carry a mini pump (See picture), and a small water bottle pocket on the back that makes the cyclists have easy access to their water bottle! Note: Water bottle and pump not included. Material: 600D Polyester and 1000D Cordura, Velcro Attachments, Elastic in the Small Water Bottle Pocket. Mount: 3 Velcro Straps to Mount onto Rack. Strap: 1 Carrier Handle, 1 Shoulder Strap. Weight: 1 lbs (16 oz). Dimensions of Main Compartment: 12 in x 4-6.75 in x 5.5 in (Bag Filled: 12.13 in x 4.1-7.13 in x 5.7 in) Bag is angled in height. Dimensions of Side Each Side Pocket: 10.5 in x 3-5.5 in x 1 in (Bag Filled: 10.63 in x 3.25-5.55 in x 1.63) Each pocket is angled in height like the main compartment. 3 Velcro straps for easily and securely mounting onto a rack! If you have any questions about this product by BV, contact us by completing and submitting the form below. If you are looking for a specif part number, please include it with your message.